Whoops, I realised today that I am a tad behind in my WIPs posts. Sorry about that. I need to get the camera back out so I can photograph more WIPs and UFOs. That means that tomorrow, I need to enter the sauna that is my studio! The show room has a reverse cycle air conditioner, but I need to replace the batteries in the remote, and I keep forgetting to take new ones up to the bungalow. Whoops. Last week I was complaining about the cold weather, and mentioned that we had snow in the alps. Right now, I could use some snow, just to cool down the house enough so that we can all sleep. 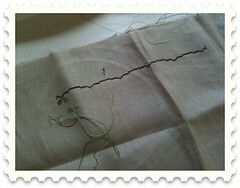 So appropriately, the next WIP is Garden of Snow from Country Cottage Needleworks.